Prices in prime outer London fell in October, ending a period of 40 consecutive months of growth. A decrease of -0.2% was the first fall since May 2011, which meant annual growth slowed to 10.1% from 11.8% in September. Despite the fact annual growth eased, it exceeded the figure of 8.4% in October last year. Knight Frank forecasts growth in prime outer London will slow to 3% in 2015, predominantly due to the possibility of a mansion tax after the general election in May next year, though we expect cumulative growth of 26% between 2015 and 2019 as demand continues to exceed supply. Doubt also surrounds the timing of an interest rate rise even though weak wage growth and low inflation means the likelihood of a nearterm increase has receded. The combination of this uncertainty and the fact prices have risen strongly over a prolonged period of time means annual growth will unavoidably slow, which it has been doing since the summer. The south-west London index fell -0.5% in October, taking annual growth to 9.1%, while prices in the north London area of Hampstead fell -0.2%, which meant annual growth was 5.6%. The most marked decrease was in Fulham, where prices fell 1.1% in October. The area has a high number of houses worth between £2 million and £4 million, which could potentially be liable for mansion tax. Meanwhile, there was growth in east London, with prices increasing by 0.4% in Wapping and 0.1% in Canary Wharf in October, the only two Knight Frank offices in prime outer London to record a rise. Both areas benefit from their relative proximity to London’s two financial centres of the City and Canary Wharf, the fact they have fewer £2 million-plus properties and the emergence of high-quality new-build schemes in east London that lifts prices in the re-sales market. Rental values fell -0.1% in October and the annual decline was -0.9%. 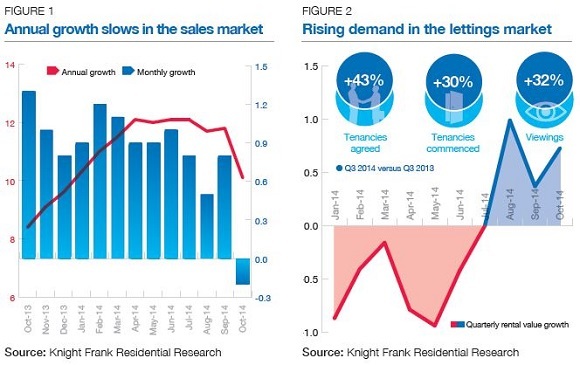 Despite the decrease, demand rose in the third quarter of 2014 compared to last year. A rising number of viewings and tenancies meant quarterly growth remained positive, as figure two shows. 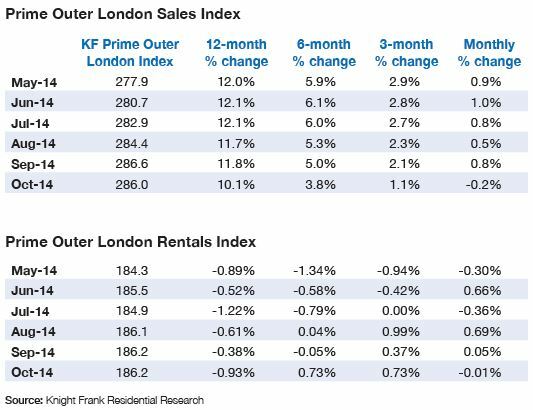 The Knight Frank Prime Outer London Index, established in 1997, is the longest running and most comprehensive index covering the prime outer London residential marketplace. The index is based on a repeat valuation methodology that tracks capital values of prime outer London residential property. ‘Prime outer London’ is defined in the index as covering: Barnes, Battersea, Canary Wharf, Chiswick, Clapham, Fulham, Hampstead, Richmond, Riverside*, Wandsworth & Clapham, Wapping and Wimbledon. ‘Prime London’ comprises all areas in prime outer London, as well as Belgravia, Chelsea, City & Fringe, Hyde Park, Islington, Kensington, Knightsbridge, Marylebone, Mayfair, Notting Hill, South Bank, South Kensington and St John’s Wood. *Riverside in prime outer London covers the Thames riverfront from Battersea Bridge in the east running west to Kew Bridge. In prime central London, it covers the Thames riverfront from Battersea Bridge in the west running east to Tower Bridge and includes South Bank. © Knight Frank LLP 2014 - This report is published for general information only and not to be relied upon in any way. Although high standards have been used in the preparation of the information, analysis, views and projections presented in this report, no responsibility or liability whatsoever can be accepted by Knight Frank LLP for any loss or damage resultant from any use of, reliance on or reference to the contents of this document. As a general report, this material does not necessarily represent the view of Knight Frank LLP in relation to particular properties or projects. Reproduction of this report in whole or in part is not allowed without prior written approval of Knight Frank LLP to the form and content within which it appears. Knight Frank LLP is a limited liability partnership registered in England with registered number OC305934. Our registered office is 55 Baker Street, London, W1U 8AN, where you may look at a list of members’ names.